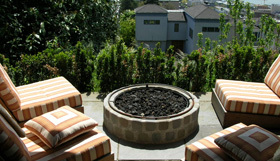 We suggest beautiful gas fireplaces and firepits that leave you free to entertain and require minimal clean up. You can start, adjust and snuff out fires with a remote control. With gas-fueled fireplaces and firepits, there is no worry about burn-bans, smoke, sparks, irritated neighbors, messy ashes or woodpiles. If you prefer traditional wood-burning fireplaces and firepits, there are many styles and designs to discuss.